This model is released in a series of 1/43 scale models, there is no name of the manufacturer on the box or on the bottom of the model, but this Lamborghini Gallardo GT3 is fixed to the plinth with a small triangular screw, which makes to believe this one was made by Ixo, they usually have this special screw for their models ... I had to write to Ixo and ask for a special, triangular screwdriver, which they sent me several years ago, for free. 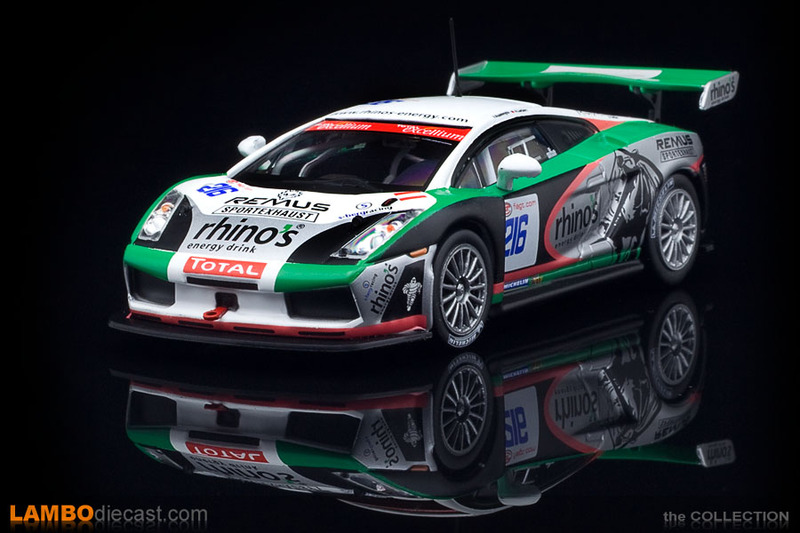 This is a 1/43 scale model of the Lamborghini Gallardo GT3 race car as it was entered into the Coupe du Roi of the 24h de Spa back in 2007 by S-Berg racing, they had three cars in the race, numbers 215, 216 and 217 ... this model is the number 216 driven by Antoine Leclerc and Vadim Kuzminykh ... sadly after 232 laps, they had to leave the race and they did not finish. I was actually covering the 2007 24h de Spa race as a press photographer and took some amazing photos of these Gallardo GT3 race cars during the test days, the qualifying and the actual race itself, at one point all three cars were located in the pitlane behind each other, a wonderful sight. 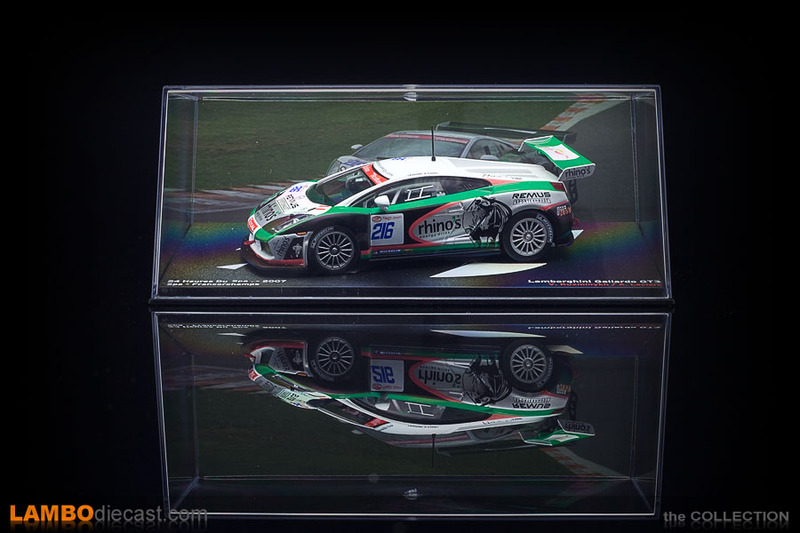 Now, this surely isn't the best detailed 1/43 scale model of the Lamborghini Gallardo GT3, that would be the Looksmart version I also own, but this I was interested in this model for two reasons ... one the price, at only €20 this sure was a nice deal, and second: I still remember spending time in the pit box of the S-Berg team, had some great conversations with both the team principals and the drivers. 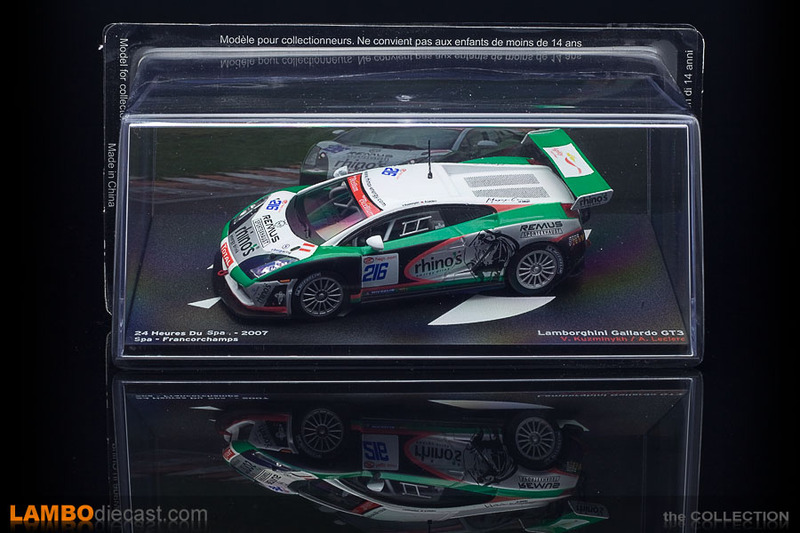 These models are part of the 'Passion de la vitesse' series, a publication that released scale models like this a few years ago, each model came inside a display case on a cardboard package, these were for sale in magazine shops in France ... and are available on eBay at a nice price, this Gallardo model was number 28 in the series. So I added this model just for sentimental reasons, it isn't very detailed, most vents are just satin black paint ... but seeing, and hearing this car in real life made it worthwhile to get a scale model of her.